Nasty Fall weather seems to have set in and I am less than thrilled. The crazy wind and pouring rain makes it almost impossible for me to leave my house. Fall seemed to start out with some beautiful weather. Yeah, the air was crisp and cold, but the sun was shining and the falling leaves looked beautiful. That was until the rain set in. The rain seems to have turned the beautiful leaves into a mushy mess at every turn. 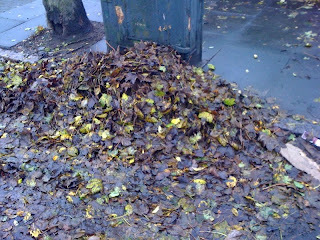 And those beautiful leaves now mask hidden puddles for me to soak myself in! They also pose as a "slipping hazard" for an already clumsy person. Put this together with my center of gravity being thrown off, and it isn't a good combination! 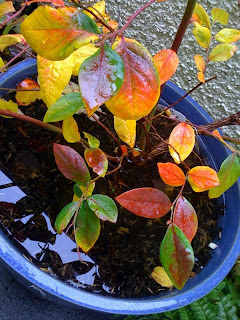 Its been raining so hard the last few days that our poor blueberry plant has become waterlogged under a few inches of water. Thankfully, Ian came to its rescue today, trying his hand at using a cup to remove the water...we love our little blueberry plant and want it to make it through the winter! Hopefully (though I am not holding my breath), the fall and winter will prove to have some beautiful weather for me and not just icky stuff that keeps a largely pregnant woman (soon to be protective, germ-a-phobe mother) from being housebound until spring! I'm sorry the nasty weather has come. I will try and sent some sunshine your way.